We are reading! TOGETHER. And are so excited about this event! 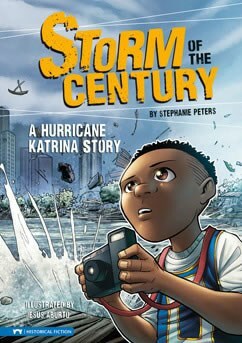 Read "Storm of the Century: A Hurricane Katrina Story" by Stephanie Peters as a family on myON over winter break from Dec. 23 through Jan. 2. Then on Sunday, Jan. 3, join the online book discussion from 4 to 6 p.m! Who: Our entire Sioux Trail community! What: One book that we all read! When: Between December 23rd - January 2nd. Online group “discussion” on Sunday, January 3rd from 4 to 6 PM. Where: In your own home! Through the internet: computer, iPad, SMART phone, Chromebook, Kindle, other device. Why: Build our school community and develop literacy through reading the same book! How: There are lots of options! If you do not have access to technology in your home and you need a paper copy of the book, please let your classroom teacher know by the morning of Tuesday, Dec. 22 in whatever way works best for you…..phone, email, or with a note.